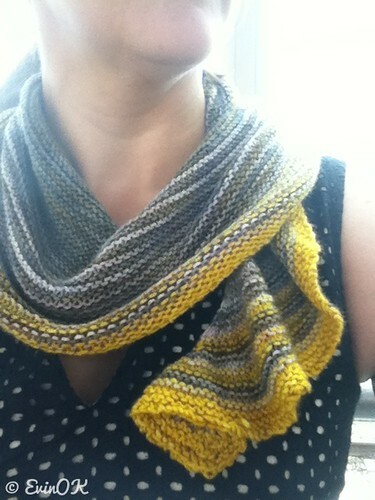 Everyone needs something fairly mindless to knit and my project for 2013 was Color Affection by Veera Välimäki. It was decided as a KAL (knitalong) with my Sunday knitting friends. I chose colors that would coordinate with a dress I have. It is actually the dress below but in adult size. I LOVE IT. The dress is beautiful on its own so I wanted something subtle and smallish to just accent my neck and add some warmth. This meant I ended up modifying the Color Affection pattern to be smaller. I chose to use sock yarn for the project because I had it handy. I followed the Color Affection pattern but omitted one third of the rows from each section. When I switched to the third colour section, I started increasing by four every row to create the twisty edges that give it a nice coverage and drape in spite of the smaller size. I did not do the short rows section. Here is my project on Ravelry. To bind off, I used the Surprisingly Stretchy Bind Off. It is fabulous. Then I wet blocked it. 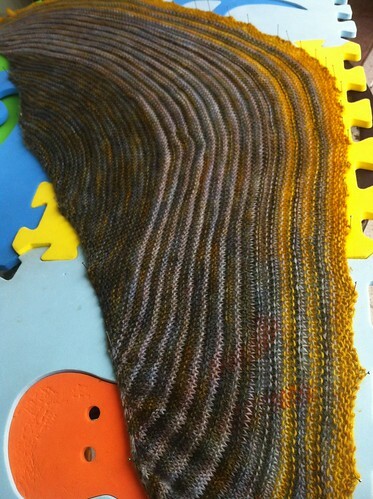 This entry was posted in Knit Shawls & Wraps and tagged Knitting, yarn. Stunning! You look lovely wearing it 🙂 The colours are reflected in your eyes which is absolutely mesmerizing.